Abstract: Orthogonal time frequency space (OTFS) modulation is based on the transmission of information symbols in the delay—Doppler domain rather than in the time—frequency domain (as with OFDM). This has been recently advocated as the modulation scheme appropriate to channels exhibiting large Doppler spreads. In its original version, OTFS uses transmit and receive shaping waveforms which are biorthogonal with respect to translations by integer multiples of basic time and frequency intervals. Since the uncertainty principle makes it impossible to design waveforms exactly satisfying this biorthogonality constraint, we examine the performance of OTFS using practical (e.g., rectangular) waveforms. We also describe a message-passing demodulation algorithm matched to the features of OTFS. The calculation of error probability shows the amount of diversity that can be achieved on fading channels. Biography: Ezio Biglieri is an Honorary Professor at Universitat Pompeu Fabra, Barcelona, Spain. Formerly, he was a Professor of Electrical Engineering at Poltecnico di Torino, Italy, and at UCLA. 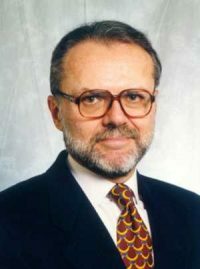 He was the President of the IEEE Information Theory Society in 1999 and the Editor-in-Chief of the IEEE Transactions on Information Theory, the IEEE Communications Letters, the European Transactions on Telecommunications, and the Journal of Communications and Networks. He is a Life Fellow of the IEEE. Among other honors, Prof. Biglieri has received the IEEE Donald G. Fink Prize Paper Award (2000), the IEEE Third-Millennium Medal (2000), the IEEE Communications Society Edwin Howard Armstrong Achievement Award (2001), the Journal of Communications and Networks Best Paper Award (2004, 2012, and 2015), the IEEE Information Theory Society Aaron D. Wyner Distinguished Service Award (2012), and the EURASIP Athanasios Papoulis Award (2013).